Many thanks to Civilian Reader for letting me stop by and chat about editing and writing. I’ve been thinking about what you might say to a new writer who wanted to write a short story, a great one (who’d want to write anything else?) When I first started to work on a list of tips on how to write a terrific short story I drew a blank. I’ve not written a short story since high school, so I’m no expert. I’ve not even thought about writing a short story myself. But then I realized that, like you, I read. I read a lot. And what I mostly read is short fiction. So, it’s possible I might have picked up an idea or two. The only way to learn how to write a great short story is to read great short stories. Read them a lot and think about them. Try to work out how they work and why. Pick a writer whose work you love and see how their stories work. If you love fantasy stories, try the work of Fritz Leiber or Ursula Le Guin, and see if you can unpick their stories. They knew what they were doing. If you’ve already written a great short story you probably know all of this stuff, and possibly far more. If you’re just starting out, though, it might help. And if you are starting out keep going. You’ll probably write some stinkers. You’ll possibly write some stories that are almost exactly like stories written by people whose work you love. That’s fine. That’s what you should be doing. You have to write through that so you can get to the stories that only you can tell, the ones that are definitely going to be great. And when you do, send them to me. I love great short stories. 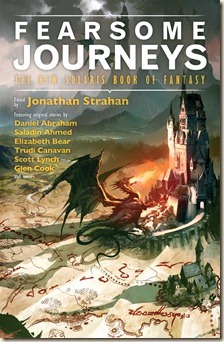 Fearsome Journeys is out now, published by Solaris Books.